Popular trails in rural Aberdeenshire will be sealed off to walkers to prevent them from being attacked by a lovesick capercaillie which has grown increasingly angry on its quest to find a partner. The Glen Tanar Estate announced that the animal has been “displaying” and “holding its ground” on some of the trails in the area. The activity, known as “lekking”, is designed to entice visiting females which are surveying prospective partners and the trails have been closed as it is against the law to disturb a capercaillie while it is trying to mate. A statement on the estate’s website said: “Although it is currently outwith the normal time of year for lekking activity, the behaviour being displayed by this bird is lekking behaviour, therefore, disturbing this bird may constitute an offence. 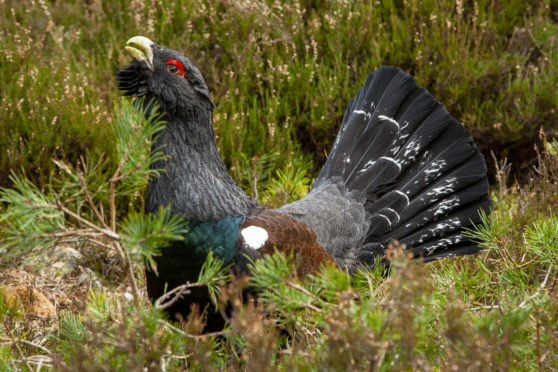 The statement added that the estate is “blessed with a good habitat”, which means it is home to a variety of protected species including the capercaillie. Signs will be erected, warning messages will be posted on social media and rangers will ramp up patrols in an effort to deter people from visiting. The statement added: “The aim is to minimise the risk of human disturbance interfering with breeding behaviour, to reduce the risk to the capercaillie from people or dogs defending themselves if attacked by the bird and to reduce the risk of injury to a member of the public from the bird.